Coffee plays an interesting role in this movie. It's one of my favorites for light romance and unrealistic endings, and the key characters are just so fine to look at, it's hard not to enjoy it just for the aesthetics. And c'mon, who doesn't enjoy a good Cinderella story? So it wasn't until about the 10th or 12th time through that I even noticed the "coffee moments". First I want to point out that there's often a blatant absence of coffee where I expected to see it. For instance, here we have a meeting, of suits, lawyers, high powered business folx, etc... and NO coffee on the table. Not one cup. Is that realistic? I can see a character like Edward Lewis not needing coffee, your basic A-type Shark-in-a-Suit, but I'd think the others would ALL need a LOT of coffee in order to keep up with him. 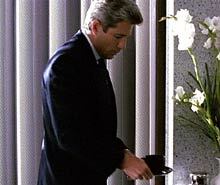 Later in the movie we get a shot of another meeting breaking up, and there, finally are the coffee cups I expected to see. My feeling was that the coffee in this scene was meant to give the feeling of exhaustion, hard work, having been through the wringer, corporately speaking. 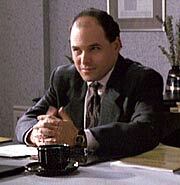 Two other noticeable uses of coffee... One is that the sleazy lawyer, played wonderfully by Jason Alexander, seems to be the only guy with coffee and/or coffee toys. In the scene shown at right, he's the only one with coffee in front of him. And look behind him in the shot below. Is that a Krups or some variation of espresso machine there on the left? I guess lawyers do need caffeine to keep up. At least this one does. I had a vague notion that we're also meant to associate coffee with sleaziness here, but I ignored it. The last coffee moment is the most significant. In fact, it's pivotal, and I think it's interesting that the filmmakers chose to use coffee to communicate this important point in the movie. 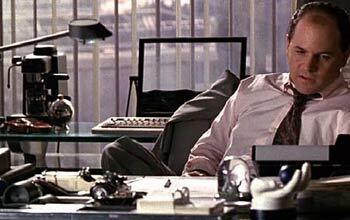 Richard Gere's character, Edward Lewis has done a complete about-face, and decided not to take over Morse's company, but to partner with him instead, to "build something". This is the result of his relationship with Vivian (Julia Roberts) and shows us that his love for her has changed him. In the beginning of this scene, the final "takeover" meeting is about to begin, when Edward puts on the brakes. The other suits are dismissed from the meeting, and Edward turns to Morse to propose his new idea. But he seems not to know how to begin. So he starts by offering Morse some coffee. He goes to the sideboard, pours Morse a cup, and brings it to him. This is an act of submission, of kindness, and it shows Morse that the Shark has stepped down and is no longer on the hunt. Unfortunately we don't get to see much of the actual coffee pouring, or drinking, but it's there. 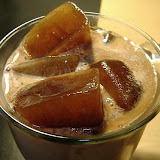 A delicious transformational coffee moment.